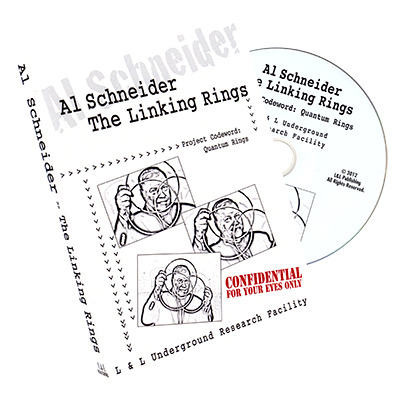 You'll find two Linking Ring routines demonstrated and explained on this DVD. The first utilizes five rings and is a shorter routine suitable for use in a parlor shows or as an opener for a larger stand-up show. The other is a six-ring routine intended to be a featured item in a very formal stage show. This routine utilizes several people from the audience to come up on stage and assist the magician. Both of these routines serve to introduce several new bold and original ring concepts. The first is a five-ring false count that, while fairly easy to do, really appears as if you are fairly counting five separate rings. The other concept is a keyless ring routine. In the six-ring routine, the performer links the rings and gives them to audience helpers to examine. Please keep in mind that the helpers have all the rings and each and every one of them is completely solid. This is accomplished by clever switching, creating the appearance that single rings are linked together.